In the early years, outdoor Liturgies and services were held on the terraces behind St. Mary’s Villa. Soon, crowds got to be so large (600 came the first year - in the rain!) that we decided to beautify and expand the facilities. Fortunate to have a natural rock outcrop on the property, in the late 1950’s it was decided to create a beautiful grotto modeled after the grotto at Lourdes, France. Both the grotto and outdoor Stations of the Cross were designed by the famed architect, Brother Cajetan J. B. Baumann, O.F.M. (1899-1969). Terracing and long staircases were built for the convenience of the pilgrims. Since then, outdoor services and Liturgies have taken place at the marble altar in front of the grotto. 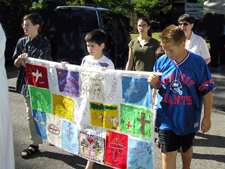 The popular Holy Dormition Pilgrimage has been held on our property in easy-to-reach Sloatsburg, NY since 1954. It is always held on the weekend before the Feast of the Dormition (Assumption), August 15 (rain or shine). 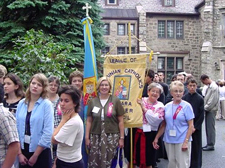 Usually attracting some 4,000 pilgrims, it is the largest annual religious gathering of Ukrainian Catholics in the US. The detailed daily pilgrimage schedule is posted in News or on the August pilgrimage dates on our calendar, beginning in June. 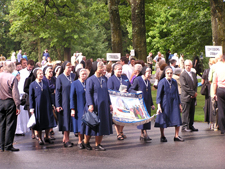 Saturday evening events - Pilgrimage events begin on Saturday evening with a Divine Liturgy. There is a break for a snack followed by a panakhyda memorial service for deceased clergy and lay pilgrims, and later, a candlelight procession to the grotto where Moleben, a prayer service to the Mother of God, and Vespers are held to close a prayerful and peaceful evening. Sunday events – The highlight of the pilgrimage is the Sunday morning Pontifical Divine Liturgy, which is preceded by a procession to our outdoor grotto. Also on Sunday is the Akathist to the Mother of God sung by the sisters, a youth Liturgy, Stations of the Cross, Moleben, and a healing service. There is the blessing of religious articles, holy water, flowers and herbs (traditional on the feast of the Dormition), and the blessing of the cars and buses of departing pilgrims. There are food concessions each day handled by the loyal and hardworking League of Ukrainian Catholics (LUC) and other lay volunteers (all of whom we love and could not do without!). Confessions are heard Saturday evening and all day Sunday in Ukrainian and English. Confessions are also heard in Polish, Russian, Slovak, Spanish, and Portuguese most years. A family day - The pilgrimage is a great family day and many who attended as children now relive pleasant memories with their children. Besides the spiritual aspects, families can explore our beautiful and spacious property (formerly the Hamilton Estate); especially the remarkable St. Mary’s Villa (1904). Children have plenty of room to walk around our grounds and can play away from the areas where services are taking place. In front of St. Mary’s Villa, there is a large font that holds water for blessing. Pilgrims are able to take this blessed water home with them. Don’t worry about large crowds; we have plenty of space, huge tents to shelter pilgrims from the heat or rain, and ample parking! In keeping with the religious theme of the weekend, we do not have outside vendors nor do we permit alcoholic beverages. Youth Campout - There is a Youth Campout Saturday night (rain or shine) on the lawn behind St. Mary’s Villa. The supervised campout and spiritual program is run by Sister Natalya, SSMI, Cathectical Mniistry in the South Anthracite Deanery. Campers must register. Write for information and a registration packet to ssminy@aol.com . Campers arrive Saturday afternoon around 2 PM. Come and rekindle friendships of past years and make new friends as you enjoy a spiritual and entertaining overnight campout. We hope to see you at the pilgrimage in August!